Learning from competitors is a critically important form of learning for animals and humans. A new study has used brain imaging to reveal how people and animals learn from failure and success. The team from Bristol University led by Dr Paul Howard-Jones, Senior Lecturer in Education in the Graduate School of Education and Dr Rafal Bogacz, Senior Lecturer in the Department of Computer Science, scanned the brains of players as they battled against an artificial opponent in a computer game. In the game, each player took turns with the computer to select one of four boxes whose payouts were simulating the ebb and flow of natural food sources. Players were able to learn from their own successful selections but those of their competitor failed completely to increase their neural activity. Instead, it was their competitor’s unexpected failures that generated this additional brain activity. 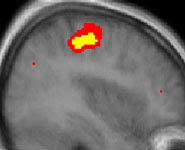 Such failures generated both reward signals in the brains of the players, and learning signals in regions involved with inhibiting response. This suggests that we benefit from our competitors’ failures by learning to inhibit the actions that lead to them. What’s on your computer’s mind? Surprisingly, when players were observing their competitor make selections, the players’ brains were activated as if they were performing these actions themselves. Such ‘mirror neuron’ activities occur when we observe the actions of other humans but here the players knew their opponent was just a computer and no animated graphics were used. Previously, it has been suggested that the mirror neuron system supports a type of unconscious mind-reading that helps us, for example, judge others’ intentions.